To the northwest of Chiang Mai in Thailand and nestled along the border with Myanmar, the mountainous and largely forested province of Mae Hong Son offers plenty of scenic natural beauty and outdoor activities to go with it, a captivating rural charm blended with a refreshing laidback vibe, and the fascinating culture of its ethnically diverse people. On the section of the Mae Hong Soon Loop between Pai and Mae Hong Son town, Tham Lot makes for an interesting side visit. About 10 kilometres off the route, this is a huge cave system once inhabited by prehistoric man and where ancient clay pottery and carved wooden coffins have been found. While in the area, the border village of Ban Rak Thai (literally meaning ‘the love Thailand village’) can be visited as well. The village was settled by former Kuo Min Tang fighters from Yunnan province in China, after the communist takeover of that country, and there is Yunnanese Chinese food to enjoy as well as Chinese tea shops, and the enchanting scenery of the surrounding valley and hills. Nearby is the Pang Ung, Pang Tong Royal Development Project where the picturesque scenery has earned the area the nickname of the ‘Switzerland of Thailand’. Pang Ung used to be an illegal opium planting area until an initiative of His Majesty the late King Bhumibol Adulyadej saw the area, and its people transformed into a place that now grows various types of produce like avocado, persimmon, Chinese pear and Chinese bayberry. 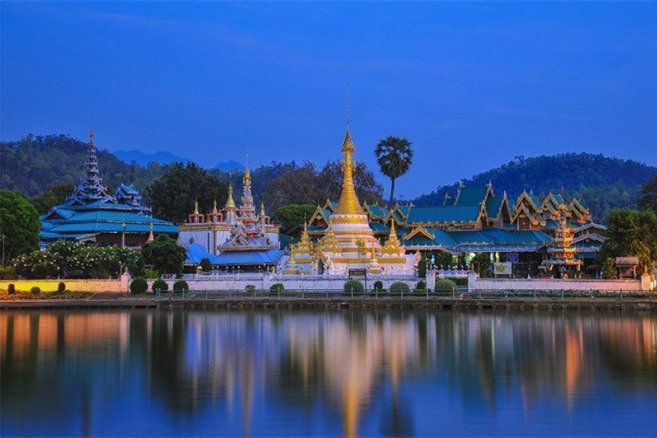 For those visiting in November and early December, the Bua Tong Blossom Festival in Mae Hong Son’s Khun Yuam district is a chance to see the mesmerizing sight of the area’s hills and valleys blaze into bright gold as the Dok Bua Tong or wild sunflower is in its blooming season. Held alongside the Festival is a local market selling local arts and crafts and fresh farm produce. Mae Hong Son is one of the 55 secondary destinations the Tourism Authority of Thailand is promoting through the “Amazing Thailand Go Local” campaign, the aim being to spread more tourism revenue into rural areas and grow community tourism in a responsible and sustainable manner, while also evening out seasonality and weekend/weekday travel flows.